When Natalie reached out to me nearly a year ago, I was immediately excited about her new business. I was near the end of my pregnancy with Finn and so ready to be back in the land of soft & tiny baby clothes. I didn't know it then, but that baby I was carrying was going to have some serious eczema issues, and high quality clothing would became quite important to me. So let's talk about the Softsie! It's the most adorable pair of footed pajamas ever! But I use the term pajamas tentatively, because if this little sleeper is clean, Finn is wearing it. Day or night. But especially on those stay home all day and be cozy kind of days. 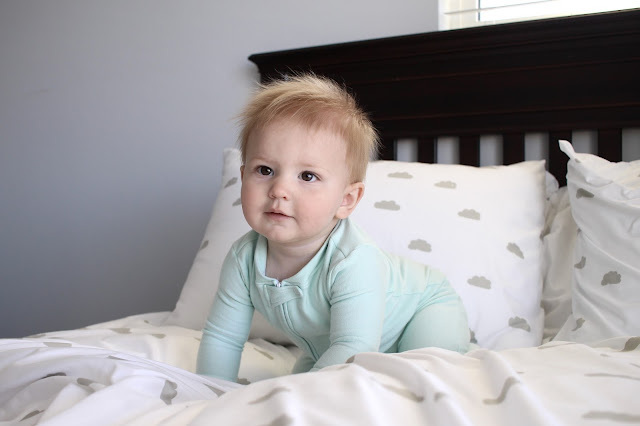 The fabric is infused with aloe vera, jojoba oil, and vitamin E, making it perfect for Finn's skin. It is so buttery soft. I want a blanket version of the Softsie. And I want a whole wardrobe of Softsies for Finn (and me!). Seriously, I'm obsessed. And can we talk about this beautiful mint color?! Quite possibly my favorite color ever. And it looks absolutely amazing on my little strawberry blond. Not biased here or anything. 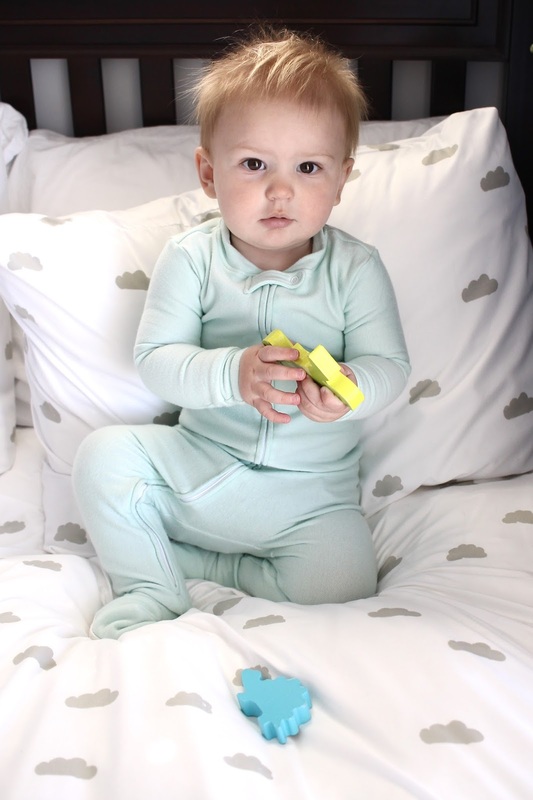 I will say that the Softsie is a bit of a splurge, but its the perfect treat for your babe. It's also the perfect gift! Every mother would love to have her baby feeling oh so soft all the time. This may be my new go-to new mama gift! If you haven't already, please go check out Softsie! You would be supporting a fellow mother, a momprenuer. I love to shop small and try to make a big effort to do so more frequently. I have noticed that the hand me downs from Liam that have held up on the most, are by far the high quality items. The things I splurged on. Congrats on your new endeavor Natalie! I was provided a Softsie free of charge, but all opinions and shares are completely my own. I can't wait to receive ours!! Bodhi is having some serious dry skin issues!! It looks so soft from the pictures. That color is amazing on Finn too. Sweet sensitive skinned boy! Love finding a great product that is from a small business. Sounds amazing! I know they call them sleepers but I also had Noah in them the majority of the time when he was a baby too! Comfort is key! I've seen the softsie on a couple other blogs and it sounds fabulous! I may have to splurge and get one for Logan, especially since he has mild eczema too! Also, I'd love to hear what kind of bath/lotion products you use for Finn! Those jammies sound heavenly, I kind of want one for me. And could Finn be any cuter?! Do they have softsies in adult sizes? I want one! and love those cloud sheets. My eldest had very bad eczema.. quality of fabric is so important. Adorable, as always. Exactly what I was going to ask - one in my size? I LOVE this color especially, seems like a great product!! Such a great post, Laura! I love seeing Finn is his sweet Softsie! Wish I would have known about this last year. Sophie no longer wears sleepers :( They look so comfortable. Do they make adult sizes? They look so comfy! We don't have eczema, but both kids have sensitive skin and only want to wear "soft" clothes, so these are right up our alley! Definitely checking them out! We love our Softsie!! I really want her to make pajama pants for women!! If I had a baby (or if I needed a baby shower present! ), I would totally check her out. I've seen a couple people post about Softsie and it sounds amazing! Oh they look so awesome and soft! That color absolute perfection. Adorable pictures of your sweet boy!! Ooh checking this one out! Aw I love this! So, sweet on him, and the color is perfect. Also, I love the idea of something a baby can where to sleep or just during at at home day because comfort is so important. Thanks for sharing!